It would be the adventure of a lifetime for anyone else, but Allan has a larger-than-life backstory: Not only has he witnessed some of the most important events of the twentieth century, but he has actually played a key role in them. Starting out in munitions as a boy, he somehow finds himself involved in many of the key explosions of the twentieth century and travels the world, sharing meals and more with everyone from Stalin, Churchill, and Truman to Mao, Franco, and de Gaulle. 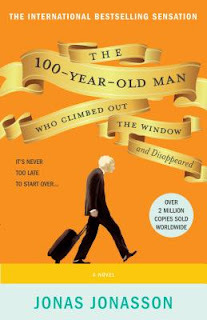 Quirky and utterly unique, " The 100-Year-Old Man Who Climbed Out the Window and Disappeared" has charmed readers across the world. Crazy, silly, sweet, quirky, hilarious. Every page in this book is action packed and you'll have no idea what is going to happen next. Go ahead and guess, you'll never be able to predict a damn thing. This was an absolute joy to read...it was like listening to your funny drunken uncle trying to give a history lesson. Delightful! Read this book. If you have to beg, borrow, or steal it...do so! I'm serious...what are you waiting for? I'm glad you enjoyed it so much. It sounds like a blast! LOL, I'm glad I convinced you! I agree, a wonderful book (my post http://manoflabook.com/wp/?p=4988. Took it a long time to be translated into English (it was a bestseller in almost 30 countries before they "bothered"). It is great to see another positive review for this one. I ordered it from the library last week and hope I enjoy it as much as you did. I hope you do too Jackie. You'll have to let me know what you think! Looks great. I'll have to check it out. I hope you do, it's so good! Having had this recommended to me by several friends and fellow bloggers your review confirms all that they had to say and has made me even more determined to pick up a copy. Now I'm probably going to have to download it to Nook over my noon hour. Sounds awesome. Thanks for the review.